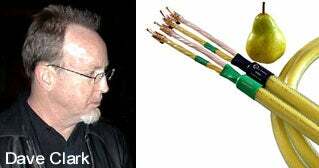 Click to viewOur rant about those $7,250 Pear Anjou speaker cables found its way to the James Randi Educational Foundation (JREF), and Randi offered $1 million to anyone who can prove those cables are any better than ordinary (and also overpriced) Monster Cables. Pointing out the absurd review by audiophile Dave Clark, who called the cables "danceable," Randi called it "hilarious and preposterous." He added that if the cables could do what their makers claimed, "they would be paranormal." We see that the Pear Cable company is advertising a pair of 12-foot "Anjou" audio cables for $7,250; that's $302 a foot! And, as expected, "experts" were approached for their opinions on the performance of these wonders ... Well, we at the JREF are willing to be shown that these "no-compromise" cables perform better than, say, the equivalent Monster cables. While Pear rattles on about "capacitance," "inductance," "skin effect," "mechanical integrity" and "radio frequency interface," - all real qualities and concerns, and adored by the hi-fi nut-cases - we naively believe that a product should be judged by its actual performance, not by qualities that can only be perceived by attentive dogs or by hi-tech instrumentation. That said, we offer the JREF million-dollar prize to - for example - Dave Clark, Editor of the audio review publication Positive Feedback Online.